This past week I was blessed to use my gift of speaking seven individual times and it was truly one of the most fun weeks of my life. I woke up Monday thinking I would be exhausted, but instead I was invigorated. It felt so good knowing that I had used my gift to glorify God. One of my presentations was a devotional for the leadership team of the retreat where I was speaking. Prior to the event we walked through the verses of 1 Peter 4:7-11, establishing our purpose to “Feed His Sheep” because the “end of all things is near.” When we serve with the gospel in mind, it creates a sense of urgency that Peter intended for us to have. It’s all for the sake of the Gospel! However, the BEAUTY of serving lies in the various gifts that each of us possesses. Peter makes the point that we all have our own unique gift. “Each of you should use whatever gift you have received to serve others, faithfully administering God’s grace in its various forms.” And aren’t we so thankful for that? Because who would really want to attend a retreat where the same thing was being done over and over again? No thank you. But here’s where the trap comes into play. Sometimes we start comparing our gift against our sister’s gift and we believe the enemy’s lies when he tells us, “Your gift isn’t special. It’s not nearly as good as hers is. You don’t have anything to offer so you might as well stay home.” Don’t believe that for a single second! Without you faithfully administering YOUR gift, the blessing for those present will never be as great as it could be. Remember that Comparison is the Thief of Joy. Step up to the plate and play your position. You are essential to the successful administration of God’s grace! I witnessed true beauty this past weekend. Each woman came with her own gift and she served it up faithfully. One had the gift of leadership. Another brought her gift of painting. There was an interpretive dance to “King of My Heart” that brought tears to my eyes. The women on the cook team brought their A-game (talk about “feeding the sheep”)! And so many more gifts contributed to this wonderful day of worship. 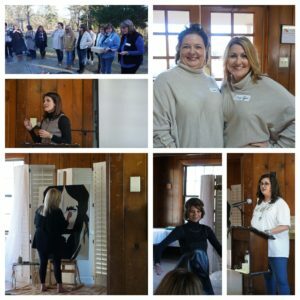 The women also accepted the challenge to take their gift of service to the next level when they resolved to do it in the “strength that God provides.” I think that’s the biggest difference maker in how a Christian woman serves. No matter what the venue (a Christian event or not), we always have the opportunity to serve in His strength and not our own. I can always tell when I’m trying to serve in my own strength because I will start to feel overwhelmed and little things will begin to irritate me. But when I hand those reigns back over to the Lord, my strength is renewed. Lastly, in order to serve effectively, we must be willing to give the glory to God. When the retreat is over and the last of the decorations are put away, offer your praise to the One who made it all happen. Scripture says, “so that in ALL THINGS God may be praised through Jesus Christ.” I am not suggesting that every single thing will go smoothly (it won’t! ), but praise Him anyway and ask Him to reveal any necessary changes that need to be made for next time. He deserves our praise in ALL THINGS. Praise is always the appropriate response! And that’s how you serve up your gift, my friend. It’s not rocket science, but it’s not elementary either. Service requires preparation, but the cost is always worth it. 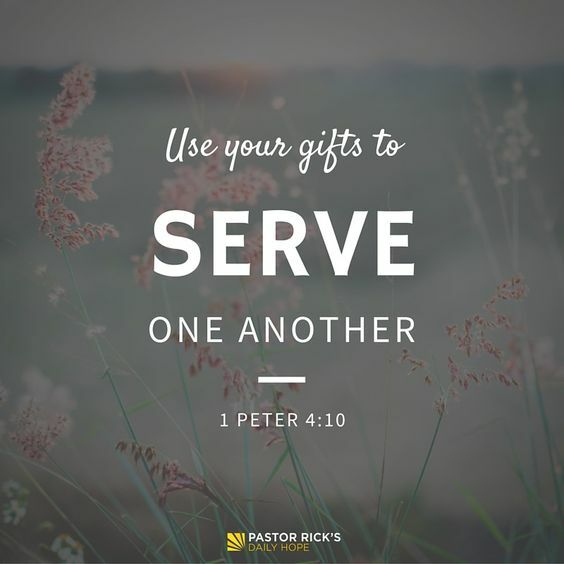 Bring your unique gift and serve it up in the strength that He provides so that His saving grace may be administered to others and then give Him all the glory. To Him be the glory and the power for ever and ever. Amen. So thankful for the retreat!! Food for the soul and time to be still and soak it all in! I agree, Stuart! Thanks for your comment. It certainly was all that! Thank you for your comment. You blessed us with an amazing message this weekend. Thank you! !